SeaBed Coming to Western Shores! We’re very excited to reveal a new game acquisition: SeaBed, Paleontology’s highly anticipated psychological yuri visual novel is getting an English language release by us! SeaBed was released in Japan in 2016 and quickly drew the attention of visual novel enthusiasts in both Japan and abroad. Text-wise, SeaBed is one of our largest translation projects, in addition to being known for its unique, high level writing style. We expect translation to take longer than usual, since we want to bring it out in the highest quality possible to meet the fans’ expectations. The English PC version is currently expected to release in late 2017. SeaBed is a critically acclaimed yuri-themed mystery visual novel told through the perspectives of three separate characters: Mizuno Sachiko, a designer plagued by hallucinations of her past lover; Narasaki Hibiki, Sachiko’s friend and a psychiatrist researching the workings of human memories; and Takako, Sachiko’s former lover who has been rapidly forgetting her past, including how or why the two women drifted apart despite being together since childhood. The Steam version of SeaBed is being updated to natively support 1440×1080 resolution. It will also include Steam achievements, Cloud support and Steam Trading Cards. You can see a full set of high resolution screenshots on SeaBed’s homepage and Steam page. The game is available for pre-order for the price of $19.99 from the Fruitbat Factory store with a -25% pre-order discount. Paleontology is an independent Japanese game circle creating yuri-themed games. SeaBed is their first game release. It was developed based on the characters of a 4-koma manga series created by their illustrator, hide38. We have even more exciting announcements coming out, so stay tuned! It’s been a while since we’ve posted one of these, but we had a lot of fun working on Sora and making it look good on modern systems, so we decided to give a little blurb on the technical changes we’ve made to Sora during the localization. Without further ado I’ll give to floor to Tony, the man behind the code. Tony: I had only played Sora briefly in our meeting with Orange Juice in May 2015, but when I actually got to spend more time with the game, it really clicked; the fast gameplay, setting, soundtrack and presentation were amazing. I was also aware of the fans’ wishes for a new release of Sora, and felt it very important to do a good job with our localized version. When we start localizing a new game, we evaluate its customization options such as screen settings and discuss what technical improvements we could add to make it more enjoyable for the players. Basically we ask ourselves “What would I like to see in this as a gamer?” and then check how feasible it would be to add it. Sometimes the engine the game runs on makes this impossible, but usually we’re able to add fancy things like higher resolution support. First higher res shot of Sora running at 720p (16:9 aspect ratio). Notice how the action is centered on the screen because the game area is supposed to be 4:3! The first tests revealed that the essentials were already in place thanks to Orange Juice’s smart coding, but there was still a lot of work ahead. The view was too far, allowing the player to see more of the game area than they were supposed to, leading to problems like enemies appearing out of thin air. Some of the backgrounds and effects were broken, some boss positions were off, and of course all 2D elements were still happily in the 640×480 land. Yet even with all the chaotic results, we could see that the game’s visuals got a noticeable improvement from the resolution increase. We went through the graphics assets we were given and found that many images had more detail than the original game resolution could show. Our graphics guys Ozhan and Yulay were on board for creating high-res versions of the menu elements. After some gameplay / image comparisons our minds were set. As a side mention, we experimented with making Sora’s gameplay fully widescreen while deciding on the new target resolution. We had a lot of fun with it and even had some back and forth with OrangeJuice, sending different builds! However, it was clear from the onset that it would break the game too much. Let’s put aside the stage 1 opening cutscene continuing forever because the missiles never hit their target, and ignore enemies popping out of thin air, how about being able to move behind bosses like Nath and getting some free shots while she’s stuck firing at nothing? The amount of undesired behavior the change would generate was overwhelming. We decided to set the resolution to 1280×960 which doubles the original dimensions, the main reason being that beyond that even the higher resolution graphics wouldn’t benefit much. While our previous attempts at full widescreen were doomed, we were able to add support for widescreen menus and cutscenes specifically. As an added bonus, since the fight against extra stage’s last boss is in a special type of area, we added widescreen support for that too! Jakke: After upgrading the resolution everywhere else, we were left with the game’s opening (at 640×480 resolution) looking strongly pixelated, not to mention all the Japanese text in it. Unsurprisingly, the original project files for the opening were gone from existence. Luckily, we received most of the original graphics used in the opening, and pieced them together with newly recorded gameplay footage to recreate the opening identically at a 1280×960 resolution with English texts. Our friends at Interweave Productions pulled some miracles with the video. Tony: We also changed the texture format. Sora uses a Japanese engine called Luna3D, which is also used by our earlier title 100% Orange Juice. The engine handles a lot of things well, but its texture handling has problems. There’s an issue with texture drawing that causes all textures to appear blurrier and the engine’s own texture format is somewhat slow and also takes up a lot of space. We changed 100% Orange Juice’s texture format some months ago and brought these changes to Sora as well. As result, our version should have faster load times despite having bigger images and the required hard drive space for textures is down to less than 100mb instead of the original’s 1gb. As for input, the original game only supported DirectInput controllers, but similarly to what we did with QP Shooting – Dangerous! !, we added XInput support to support all types of controllers, as well as added keyboard bind options. Thanks to some helpful feedback from our testers / reviewers, we also added visible keybinds in the tutorial to help new players. We had a lot of fun with making the achievements. When we started Sora, we were terrible at the game. Back in Japan, I couldn’t even get past the first stage! However as we kept playing we got gradually better and many “How am I supposed to beat this?” fights turned into satisfying victories. We think the game does a very good job at that and that’s why we had no qualms with making the achievements challenging. Jakke: It took me well over 20 hours to clear the original Japanese version of Sora on easy difficulty. While playing and testing the game, gradually feats that had first seemed impossible, turned possible, then probable, and ultimately felt only fair. I’m not great at shooters myself, so I largely used myself as a guideline for deciding on the achievements – if I can do this, most people can be reasonably expected to be able to. My personal favorite is ‘Dance Like a Flower’, which drove me to near madness before I finally cleared it (with controller burns on my thumb). Finally, go ahead and enjoy these screenshots of things gone horribly wrong during development! Our IndieGoGo project for 99 Spirits is running well – in the first week we have raised 31% of the total goal, which is cause enough for celebration. Big thanks to everyone who has already helped us there! 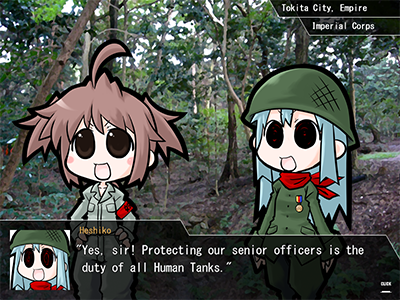 One theme has come up repeatedly in comments since our entry to Steam Greenlight and IndieGoGo – many players would like to see detailed gameplay footage from the English version. After many revisions and 4 days of recording, here it is: the first English gameplay footage from 99 Spirits. Do note that the video above is from a pre-alpha version of the game, and all content is subject to change. We found that trying to explain the gameplay in a compact video isn’t an easy task due the puzzle mechanics mixed in. I tried to shoot different aspects of the gameplay, and we added overlay explanations (top-right) to clarify what’s happening on screen. We hope you’ll enjoy the footage and don’t hesitate to drop any comments, questions or improvement suggestions. Fruitbat Factory is proud to announce our new project, Puzzle RPG 99 Spirits is doing a simultaneous entrance on IndieGoGo and Steam Greenlight. 99 Spirits, recently released in Japan Fall 2012, is the first RPG produced by the Japanese indie game circle TORaIKI, and is currently being localized for English speaking audiences. 99 Spirits was the recipient of the December 2012 Indie Dev Grant. The game features an original battle system where players will have to puzzle out the true identify of the enemy before defeating them. 99 Spirits revolves around the real Japanese legends of Tsukumogami, where everyday objects come alive on their 100th birthday. We are actively seeking the community’s support for the ongoing localization on IndieGoGo and for the game’s Steam release on Greenlight. “We truly appreciate the support of everyone interested in playing more unique Japanese PC games in English to help fund our current project and ongoing work. We are doing what we love and will continue to do so even if no funding is made available. We are doing this to gauge popular demand and to cover some of our immediate project expenses in the hopes of making a timely release possible so that we may continue creating interesting titles in the near future.” explains project lead Jakke Elonen. 30% of all the proceeds of a successful campaign will go to the original Japanese developer of the game, TORaIKI, giving fans a unique chance to support both the localization and original developer directly. Fans of the genre will also be able to enjoy exclusive items for their early support of the game including t-shirts, posters and a sneak peak of the game before it’s available to the public. The project also offers all kinds of cool rewards for the pledgers, including t-shirts, posters, an artbook, a special boxed collector’s edition and a dakimakura. 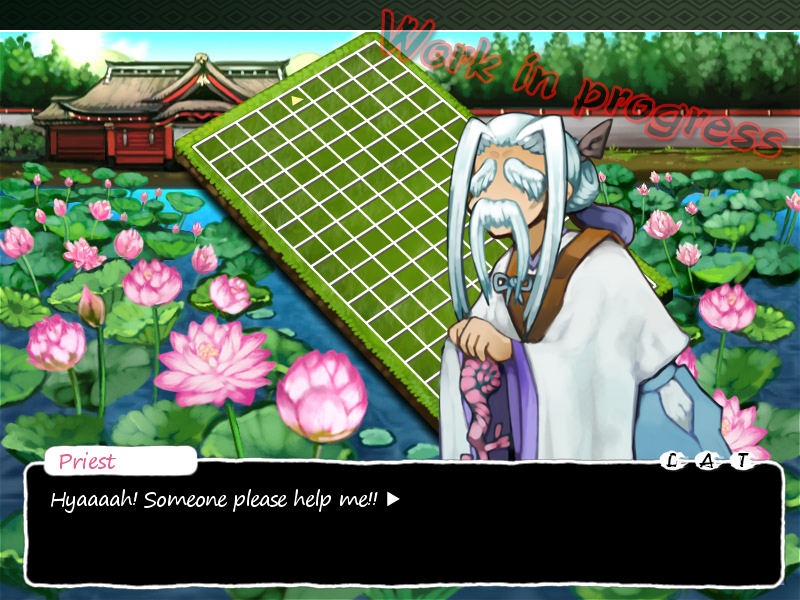 99 Spirits is planned to be released on PC (Windows) in Spring 2013. Additionally , our homepage has had a Downloads section added with trailers, screenshots and more! Good news everyone! Yesterday Bundle in a Box that our first release War of the Human Tanks partook ended with great success and our next release 99 Spirits won the Eclectic Indie Dev Grant. 6322 people who bought Bundle in a Box – Eclectic Delights were given the chance to vote for the game they liked the most amongst the 22 candidates. After two weeks of voting, our 99 Spirits won the Eclectic Indie Dev Grant. We take this as a sign that we are doing something right and can hope for a favorable reception for 99 Spirits once it is released, so it is a tremendous vote of confidence. To celebrate, we decided to publish the opening sequence of 99 Spirits, which we recently edited to English. This video will show up when you start a new game. It’s very brief and not a trailer, so it won’t show you any gameplay, you have to wait a little more for that. But this is not all! While we still have a couple of months until 99 Spirits‘ release, we have something big planned for next month already, so keep your eyes peeled! For the duration of the next six days, our War of the Human Tanks is being featured in the GamersGate’s IndieFort Bundle alongside Will Fight for Food, Zafehouse: Diaries and Zombie Shooter 2. Don’t miss this chance to grab all of them at the incredible price of $4 and save $36! Last but not least, Merry X-Mas everyone! We prettied our sites in the spirit of X-Mas if you noticed, hopefully they’ll be easier and more fun to navigate now. We also have some nice discounts coming for the holiday period, to give you a chance to buy our products at very affordable prices to gift them to your loved ones. We hope you’ll enjoy our Christmas presents, and share in our excitement for the coming year. In these post release days where we are finally receiving some much appreciated feedback from the players, I would like to talk to you regarding something that we’ve received questions about and noticed on some of YouTube videos and screenshots of the game. War of the Human Tanks uses a 4:3 aspect ratio, which means it is not widescreen (16:9 or 16:10 aspect ratio). In order to play it or any other games you have that use a 4:3 aspect ratio without getting horribly stretched in Full Screen Mode, you need to enable a simple setting in your graphic card’s options. Why this setting is turned off by default ever remains a mystery. But first let’s look at what I’m talking about. First screenshot is how our game is supposed to look and second is how it turns out without enabling the correct setting. Enabling a simple option will save you from suffering this horrible stretching. I have an NVIDIA card, so I’ll describe how to do this for NVIDIA cards. If you have something else, the process should be mostly similar. On this window, navigate to the shown tab. 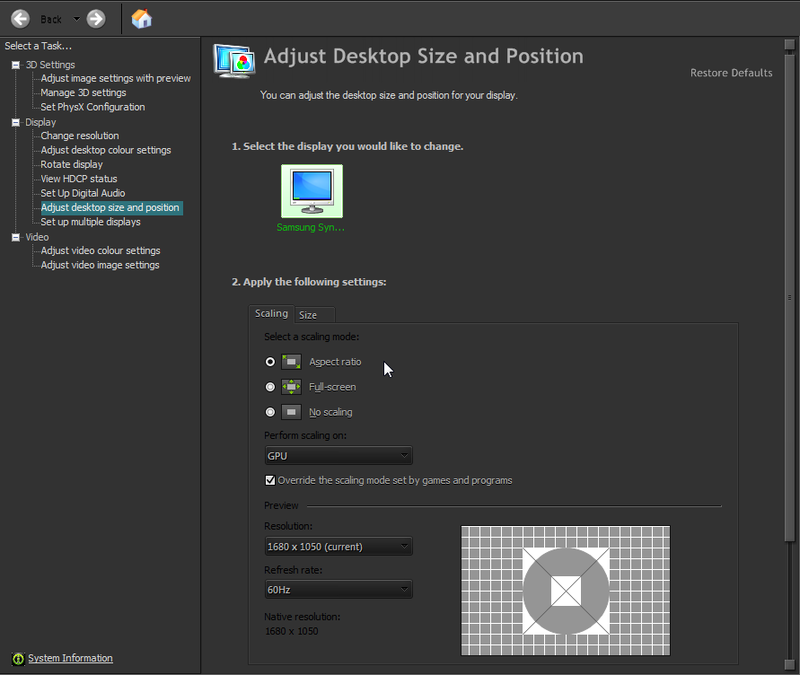 Display > Adjust desktop size and position > Scaling. If you see that “Full-screen” is checked like this: then you are going to see all games that are not wide-screen stretched, apart from a few that compensate against that problem. What you need to do to fix this is to pick the choice above it, “Aspect ratio”. Also do not forget to set Perform scaling on: GPU. Other settings on this screen don’t matter. When you follow these instructions, there will be no change to your widescreen applications. Non-widescreen applications, however, will now display in their correct proportions. We are proud to announce that the day is at hand, War of the Human Tanks is being released 14 September 2012! Initially it will be available from Desura, Gamersgate and Indievania for $9.99 (or equivalent). To celebrate this wondrous occasion Indieviddy prepared the new trailer you saw on top of this post, hope you like it.